DeskNotes is a desktop notes utility that goes beyond the standard notes typically seen. 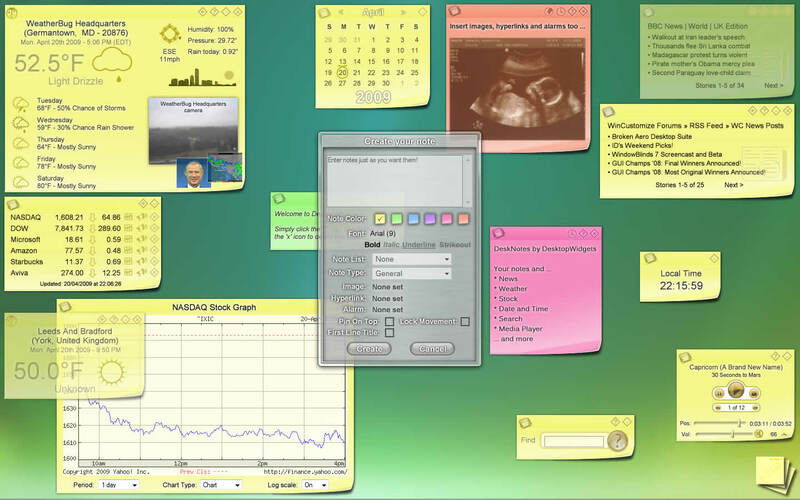 Not only can you create highly customisable notes for your desktop, but you can also place a range of special notes on your desktop. Install this trial which allows you to try the majority of functions. Should you wish, you can register DeskNotes from within the trial to get immediate access to the full functionality. Yeah! Haven't seen much of you in quite a while...hope to see more! Thanks guys. Nice to be back, I mean I've only been developing this gadget on and off for about 3 years � � Just expecting another daughter - she was due yesterday but still hasn't put in an appearance so I'll probably be up to my ears in nappies, but I certainly hope to be doing some more stuff. Look forward to any feedback you have (good or bad) as I respect yor opinions. Cheers, M.
Very amazing.. still pushing the envelope, so great! Can i import some of your's and Vad's Scripting Skills please?? Can i import some of your's and Vad's Scripting Skills please?? Haha. You do belittle yourself! Wow, fantastic work, Martin! It's good to see you around. wow this is very nice !! Happy soon to be 1st Birthday for your little angel !